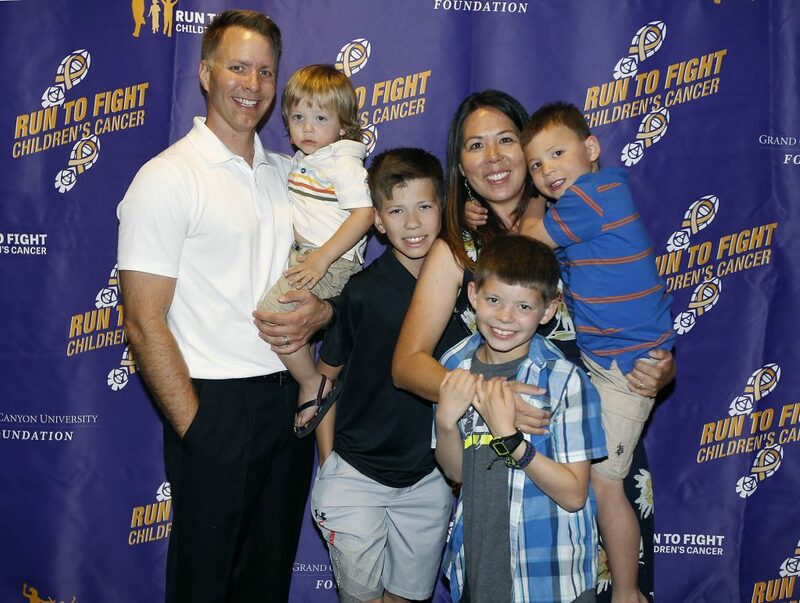 Race starter Jace Hyduchak, far right, and his family express gratitude during an awards banquet for the GCU Foundation Run to Right Children’s Cancer. The ceremony unfolded into a circle of thanks. 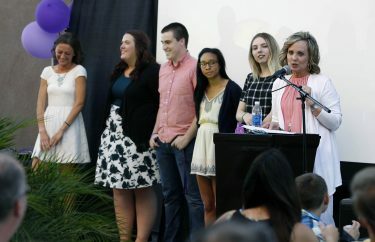 First, Debbie Accomazzo, race director for the Grand Canyon University Foundation Run to Fight Children’s Cancer, thanked those who helped raise $90,000 for pediatric cancer. The list was long — 450 volunteers, a wide and vast GCU staff, local businesses and runners determined to cross the finish line to help find a cure for and lend a hand to children battling cancer. In turn, families of children with cancer and the recipients of race proceeds — Phoenix Children’s Hospital and Children’s Cancer Network — expressed their heartfelt thanks. 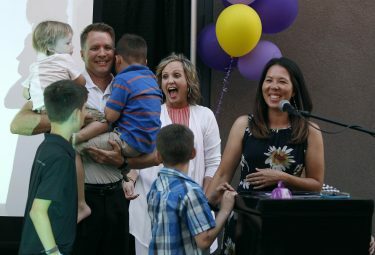 The “thankfest” ceremony Thursday night at GCU’s Canyon 49 Grill showcased a run that in its seven years has raised more than a half-million dollars for research by PCH and into CCN’s mission of supporting children and their families. “Teamwork makes the world go round and this race is one of the best examples,” said Amber Glispie, counsel for Pono Construction, a Platinum Award winner. Pono Construction, the Grand Presenting Sponsor, donated $20,000 as a sponsorship investment and raised an additional $19,000, bringing their total gift to nearly $40,000. Ann Hyduchak (far right) shares a bright moment with Debbie Accomazzo, race director, and other family members during Thursday’s celebration of cancer-fighting superheroes. For George Hyduchak, father of 6-year-old Jace, this year’s superhero race starter and unofficial captain of the 100-plus Jace’s Defenders team, the race was bittersweet. For CCN Director Patti Luttrell, the race helps pay for a much needed counselor to work with cancer patients and their families at PCH. 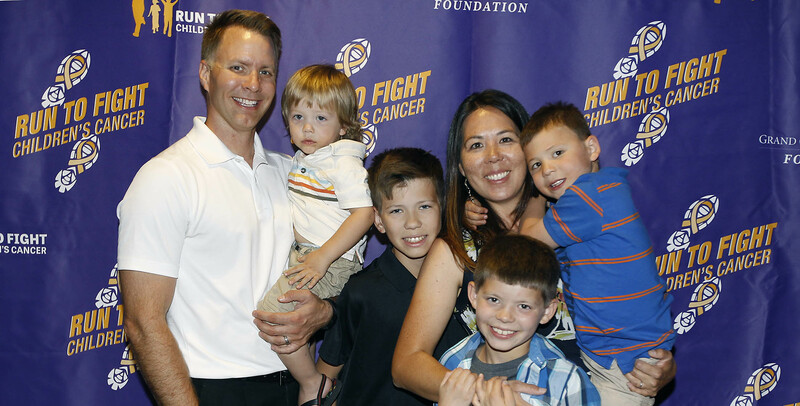 For Dr. Stacy Nicholson of PCH, the race offers a lifeline of caring. For cancer patient Kaitlin Slepain, honorary co-captain of this year’s largest team, Stronger Together, the race gave her a way to give back. Instead of attending the ceremony, Slepain was undergoing radiation for spine cancer at Massachusetts General Hospital. Race Director Debbie Accomazzo, far right, introduces the student worker race assistants whose hours of hard work and devotion make the race possible. From right, Mia Accomazzo, Julia Cummings, Piercen Gaborko, Krista Wynes and Anna Henry. But that didn’t stop the Chaparral High School senior from delivering her message of inspiration. In a video address, Slepain thanked the “overwhelming” support from family and friends. At 147 runners, her team was the largest ever to race. Stronger Together, co-anchored with Chaparral High School classmate Lauren Kettell, also raised nearly $12,000 in online donations. The two met undergoing blood transfusions for cancer. Slepain also spoke about her own childhood cancer. 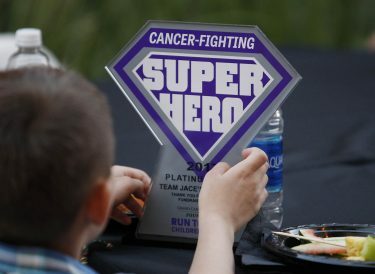 Jace Hyduchak, 6, this year’s GCU Foundation Run to Fight Children’s Cancer race starter, seems delighted with his team’s cancer-fighting superhero award. For Accomazzo, also GCU’s community outreach manager, the race accomplishes more than raising critical money to battle pediatric cancer. “Our work is not just about raising funds, it’s about raising awareness,” she said. Mission accomplished: The race and its message of hope were spread by local media outlets to their 25 million readers and viewers. The ceremony also showcased the spirit of the run. 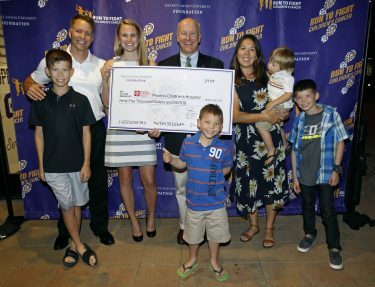 Amy Hoff (second from left) and Dr. Stacy Nicholson, of Phoenix Children’s Hospital, were presented with a donation to the hospital and are surrounded by the Hyduchak family. Overall Fundraising Champion: Team Pono Construction with $19,454. For a slideshow from the banquet, click here. For a video of a race day recap, click here.